It’s been three weeks since this year’s presidential election, and while most pundits are still talking about the fact that President Barack Obama overwhelmingly won the Latino vote, another big story from Election Day is the Asian American community’s overwhelming support for the president. Asian Americans delivered 73 percent of their votes to re-elect President Obama—the highest-ever percentage for any single candidate. Only 26 percent of Asian American voters indicated that they voted for Republican presidential candidate and former Massachusetts Gov. Mitt Romney. As part of the “Obama Coalition,” Asian Americans—together with African Americans, Latinos, young people, single women, the highly educated, and the middle class—secured a Democratic victory. 1. Asian Americans are the fastest-growing electorate in the United States. Asian Americans are a diverse and multiethnic minority group, and a fast-growing one at that. While they comprised only 3 percent of U.S. voters in 2012, that number increased 128 percent from 1996 to 2008. Composed of many distinct ethnicities, languages, and countries of origin, the plurality of Asian Americans and Pacific Islanders makes up about 4.8 percent of the U.S. population and much more than that in geographic areas such as the coasts, major cities, and Hawaii. 2. Asian Americans’ support for President Obama doesn’t reflect their party affiliation. Although Asian Americans overwhelmingly voted for the president, 49 percent of those polled identified as Democrats, 34 percent identified as Republican, and 17 percent identified as independent. 3. By a 47 percent to 26 percent margin, Asian American voters believed that President Obama cared about their community and its issues. Conversely, only 14 percent felt that Gov. Romney cared about the Asian American community, while 45 percent felt that he did not. 4. Like most voters, 58 percent of Asian Americans cited the economy as their top issue in the election. This is no surprise since in 2010 Asian Americans had the highest share of long-term unemployment. Unemployment is defined as being out of a job for 27 weeks or more. Health care and education were the next most important issues for the community. Still, Asian American voters supported immigration reform (with a path to citizenship) 57 percent to 26 percent, and not surprisingly supported the candidate—President Obama—that pledged his commitment to passing comprehensive immigration reform. One-fifth of Asian American voters polled were first-time voters. Mazie Hirono (D-HI) was elected to the U.S. Senate from Hawaii, making her the first Asian American female senator. 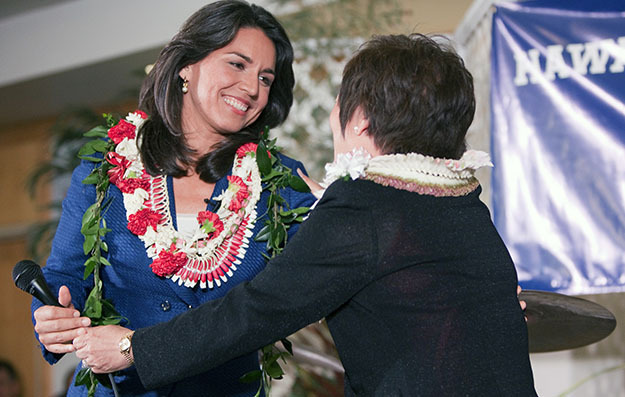 Tulsi Gabbard (D-HI) became the first Hindu to be elected to Congress, replacing Hirono in the House of Representatives. Mark Takano (D-CA) became the first openly gay person of color to be elected to Congress. Tammy Duckworth (D-IL) became the first Thai American woman to be elected to Congress. The 2012 election results illustrate that the diverse Asian American voting bloc is increasingly raising a strong and unified voice. In addition to re-electing the president, Asian Americans supported Democratic candidates 73 percent to 27 percent in congressional races, and every Asian American candidate elected to federal office in this election was a Democrat. As the Asian American community continues to grow in size, its voters will continue to have an increasing impact on elections. Both parties would be wise to take into account their perspectives and their voices.